Lake Barrington lies approximately 40km south of Devonport in Tasmania. Take the B14 to Sheffield or Barrington then to the C143 where the eastern side of the lake can be accessed from the C140 or C141. The western side can be accessed by the C132 and C135 via Lower Wilmot or Wilmot. Lake Barrington is managed by the Inland Fisheries Service as a Family Fishery and is open to angling all year round. Regular stocking with rainbow trout and trophy sized Atlantic salmon maintains the quality of angling. Lake Barrington contains a large number of trout, rainbow trout and native blackfish. The lake receives stocking of adult Atlantic salmon and juvenile rainbow trout. Most trout are between 200grams and 1 kilogram but it is not uncommon to catch larger specimens. Bait fishing is a very popular method but it is only possible at a few areas of shore due to the steep terrain. Trolling is the most popular and productive method of fishing at Lake Barrington. Anglers should be aware that Lake Barrington has an international rowing course and that the structures associated with the course need to be avoided. It is an offence to tamper with this infrastructure. Fishing licences are required for inland waters and can be purchased at any Service Tasmania shop or Service Tasmania in Sheffield. Fishing for rainbow trout, brown trout and Atlantic salmon is also accessible in the lakes and rivers surrounding Sheffield, Wilmot, Railton and Moina. Other North West hot spots include River Leven, Meander River and in the North include Lake Rowallan, Huntsman Lake, Brushy Lagoon and Four Springs Lake. 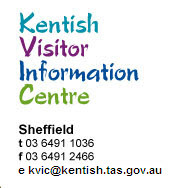 For further information on 'hot spots' and trout fishing at Lake Barrington, pick up an Inland Fisheries brochure from the Kentish Visitor Information Centre at 5 Pioneer Crescent, Sheffield.